Hajj Ali Maktabi was born and raised in Iran up until the age of eleven, when his father's death changed his fate forever. The young Ali Maktabi began his journey with his family to what was then called "Bilad Asham". He entered adult life relatively early, taking over the responsibilities of a budding salesman. He traveled around flourishing cities and villages like Damascus, Homos and Halab respectively. Commercial business began to grow, and at age Fourteen he took a leap into Beirut, the "Civilized", "Cosmopolitan" City that symbolized a balance between East and West. 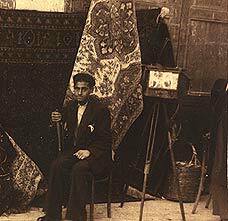 The Beiruties were an aesthetic people, appreciating Art and handicrafts, especially the exotic Persian carpets that Ali Maktabi chose. He opened his first store in Beirut, Lebanon at the age of sixteen, in Allenbi Street, located in the downtown Area. Four Years later, at age twenty, he opened a second store in the free zone area of Beirut's port. In 1968, the opening of a third branch was launched in Raouche, a larger store that would encompass more space, goods and work from the growing sons of Ali Maktabi who would soon take over. In 1975, another branch was opened in Jeddah, Saudi Arabia, where the six sons, up until today, take turns at managing the business. Over the course of these decades, the Maktabi's themselves have refined their knowledge in the craft, having custom made carpets produced exclusively for them. They have come to understand the essential differences in composition, weaving, mending, coloring, and dyes used in the making of an exotic "speaks for itself" handmade carpet.